A style staple in any ladies' jewellery collection, the classic hoop earrings have been given a contemporary twist with this pair. Created from 9ct yellow gold, this chic design features a twisted styling, adding an extra trendy touch to a timeless classic. 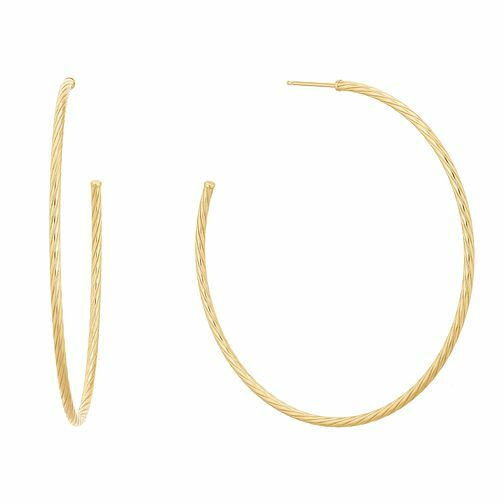 9ct Yellow Gold Large Twisted Hoop Earrings is rated 4.0 out of 5 by 1. Rated 4 out of 5 by Anonymous from Lovely earrings, secure too because of the backs. I’m hoping to be able to keep hold of both of them. Lost so many pairs during scarf weather, but these are nice and secure.